Our Magick Wands are made out of clay, metal, wood or bone, wands are used to shape and direct energy, acting as a powerful focus for creating magical space, or working to make your will manifest. Often bound with personal totems or carved with markings, it takes time to become truly attuned to your wand, though often people feel and are able to work with a certain energetic connection right away. When choosing your wand, it is helpful to develop a basic knowledge of the magical properties of woods, so that you can select a wand that matches with your intentions. While many wands are selected for the empowering force the wood provides, others such as maple or rosewood are treasured for their gentler and more subtle touch as much as the energy they provide. 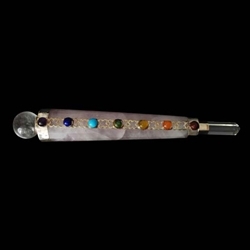 This small chakra healing wand features seven colored stones, one for each of the chakras, running up it’s silver length which ends in a quartz tip. The whole wand measures approximately 3 Inches in length. Our Clay and Crystal Chakra Wand Pendant is set with precious stones to represent each of the chakra points within your body this handmade clay wand has a small bail set into its back, transforming it into a beautiful pendant when you string it on a cord or chain. Featuring a copper shaft approximately 4 1/2 Inches, this copper healing wand features seven colored stones corresponding to each of the Chakras to aid in physical and spiritual healing.